An American cast steel anvil. These are one of the few good quality anvils that you see with a faux plate ledge. The ledge is a machining allowance that is not completely removed but WAS machined as is the step on both these anvils. 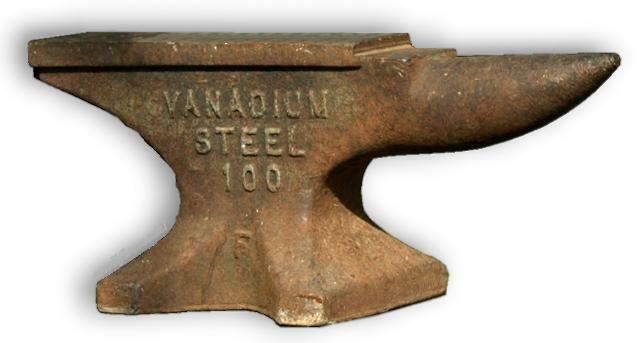 According to Anvils in America, Vanadium steel anvils were sold by Sears Roebuck and Montgomery Ward in the late 1930's and early 1940's. They came on four sizes, 70, 100, 125 and 150 pounds. Two Vanadium Steel anvils, a 70 and a 100 pound on truck tailgate. This 1935 Montgomery Wards ad was sent to us by Vern Kelderman. 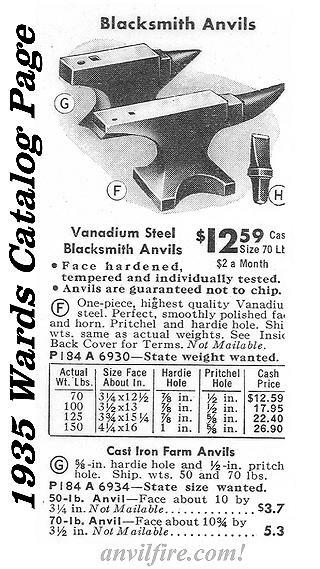 Note the price differnces between the cast steel Vanadium anvils and the junk cast iron anvils (less than half). The page also listed 100 pounds of blacksmithing coal for 75 cents per bag and hardies for 45 to 75 cents. These illustrations are not very representitive of the anvils being sold as you can see from the photos above. The crisp lines of the larger anvil look more like a Kohlswa another cast steel anvil, the lines of the cast iron anvil have the look of a thick heeled short horned cast iron anvil but the base is not recognizable.